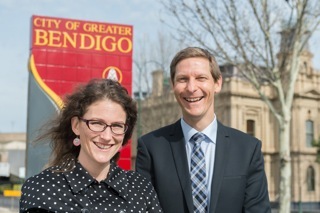 Student Willa Whitewolf and Peter Jeffery, of the City of Greater Bendigo economic development unit. Bachelor of Strategic Communication student Willa Whitewolf says anyone new to uni should do themselves a favour and enrol in Smart Skills. The pre-uni program equips students for the year ahead, ensuring a smooth transition into academic life. For Willa, it demystified many of the fears she had about returning to study as a mature-age student. “I’d never written an essay in my life,” she says. “I hadn’t written anything longer than about 400 words, and I was enrolled in a writing course! The mum-of-six still had five children at home at the time her course started. Two years later, she’s inspired many other mature-age students who may have doubted their abilities. Willa has been called upon to share her story during Orientation Week and its mid-year equivalent, Bruce Week. “When I say ‘I’m doing this with five children still at home’ I know I’ve maxed out the amount of housework anyone in that room is doing,” Willa laughs. Willa started her own course mid-year, when Smart Skills wasn’t available. So she joined a mature-age study group and worked closely with La Trobe staff to gain the skills needed to tackle that first essay. “Six months later when I did Smart Skills, it reconciled all those things I wished I’d known at the beginning,” she says. As well as uni, and looking after those kids, Willa has freelanced on a number of projects with the City of Greater Bendigo’s economic development unit, and has started her own business. “By the end of this year I’ll have a fully-functioning content production agency.” she says. Willa says in the past two years she’s learnt a lot about herself, as well as her chosen subjects. “I’ve learnt that I’m a good writer, that I’m a very capable person and that I have industry-ready skills, and I realised all of that in my first year,” she says. The lessons have also filtered down to her children, having spent a lot of time on campus with their mum. Whether you’re a VCE graduate or a mature age student, the Smart Skills program will improve your chances of a smooth transition into the academic year. Get a head start for the year and register for Smart Skills now.